The experienced team of London Lakes’ guides have the angler at the water’s edge by daylight. This is 5.00 am in summer, 7.00 am in September and April. In the high season dinner is served at 6.00 pm and fishing continues to 10.00pm. Tasmania is an island approximately three hundred kilometres by two hundred and twenty-five klilometres, located 40º to 45º south of the equator and is subject to variable weather conditions. August and September are cold with some snow and it is recommended International travellers do not visit Tasmania during these months for fly fishing holidays. 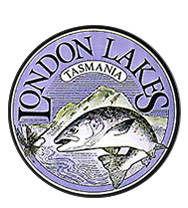 London Lakes temperatures are usually one or two degrees lower than those of Hobart. The maximum summer temperature at London Lakes is 30ºC (86ºF). Although it can be windy from September to November, storms and dangerous winds are rare. The variable conditions provide ever changing angling conditions. The angler can fish to tailing trout, polaroid trout and fish to rising trout - all in the one day. When considering a fishing adventure its best to allow a few days to compensate for inclement weather. The Central Highlands is beautiful while conditions are good but can change quickly as fronts pass across the state from the southwest. If you are serious about getting the better of our wily trout it is advisable to spend four or five days. This gives us a chance to look around and get settled in to the conditions. It always helps if we can return to a chosen place the next day knowing the fish are there, perhaps in a better mood...having a bit of time to spare will increase our chances.